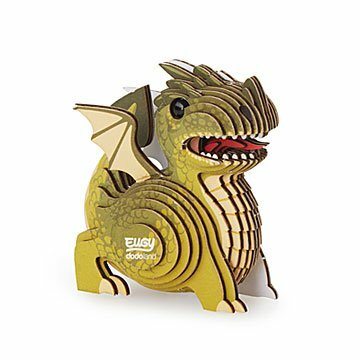 Easy and fun to build, this mighty dragon will soar around your child's imagination. Calling all fire breathers and their fearless tamers: This mighty dragon will inspire your child's imagination while helping them improve their concentration, foster hand skills, and gain confidence in their own creative powers. Made from recycled cardboard with rice-based inks and organic, non-toxic glue, the kit is safe, easy to assemble, and fun to build. Numbered pieces come together in about 20 minutes so your little one can be whisked away on their mythical adventure. Designed in New Zealand. Made in China. This is cute, but I should have read the details more closely because while I was expecting small, this thing is tiny. because I love dragons and it seemed like a fun project to build it myself. a sense of accomplishment to go with my dragon. Putting together this cute little dragon will be the perfect project! Although his Mom had to assemble/glue for her 5-1/2 year old, he just loved the little guy. He loves all animals - real and mythical!